Most Americans begin their careers at roughly age 25. It’s difficult for most young people to save much for retirement when they first start out, so for retirement planning purposes we typically assume that you will begin saving seriously around age 30. Most Americans retire somewhere around age 65. About a fourth of us will live into our nineties. Most of us will not, but when you’re planning for retirement you need to assume you will live to about age 95 or even 100. If you die sooner, retirement will be shorter and less expensive of course, but counting on dying before you run out of money is not much of a plan. Growing very old and very broke is what economists might call an “undesirable outcome”, so we plan for the worst financial case. It’s far better to plan for a long retirement and to leave unused savings to your heirs than to plan for an average length retirement and die broke. This means that we will work for roughly 35 years and be retired for as long as 35 years, and that means that we have to earn enough in the first 35 years to not only pay for our living expenses then, but also to sock away enough savings to pay for the last 35 years. That may sound like everyone needs to work for 35 years to pay for 70 years of living expenses, but it isn’t quite that bad (you only need to save about 15% to 20% of your paycheck, which is still daunting), because we have three things to help us, Social Security, personal retirement savings and a reduced cost of our standard of living. During our careers, we pay (and complain about) FICA taxes of a little over 7% of our paychecks. About 6% of that amount is to fund Social Security and the rest funds Medicare. In a way, FICA taxes are forced retirement savings, because in return for paying them we are eligible for Social Security retirement benefits when we reach age 62, realize that we would be broke without Social Security, and decide that paying FICA taxes wasn't such a bad deal, after all. Social Security replaces part of our pre-retirement work income. It replaces a larger part for lower-earners than for higher-earners, as you can see from the following table from Aon Consulting (click for a PDF of the report). 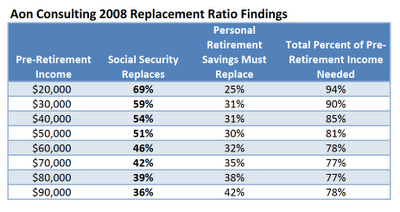 The second column estimates how much of your pre-retirement income that Social Security will replace. Social Security is intended to keep elderly Americans from falling into poverty after they must stop working, not to maintain the standard of living they enjoyed before retiring. The second factor that protects us from having to earn two incomes before retirement is personal retirement savings. We can save money in taxable accounts, 401(k) accounts and IRA’s with deductions from our paychecks while we are working. Our savings are increased in two ways. First, the IRS gives us tax incentives to save in tax-deferred accounts like 401(k) plans and IRA’s, so the government boosts our retirement savings with tax dollars (to a maximum of 6% of income). Second, the money we save earns interest that compounds and increases our retirement savings if our investment in these plans grows adequately. The third reason we don’t have to save an entire second income as we work is that we can buy the same standard of living after we retire for less money. We no longer pay FICA taxes on our income and we no longer have to save for retirement, for example. A typical household with your income would need to replace 78% of that $60,000 ($46,800) to maintain their standard of living, according to Aon Consulting’s study. 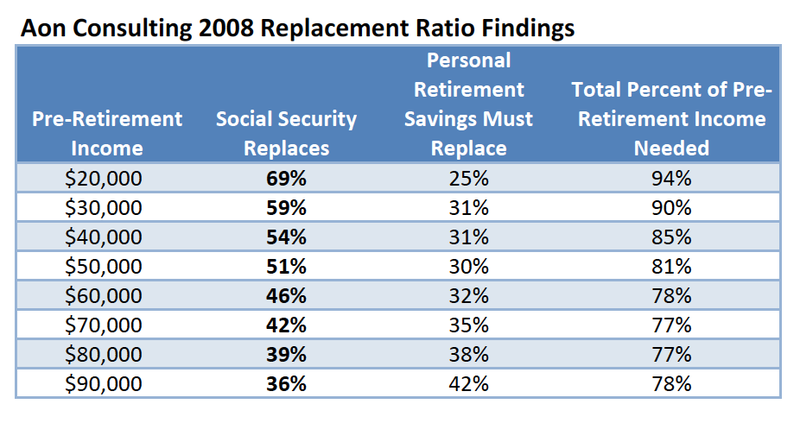 Social Security might replace about 46% of that $60,000 ($27,600). 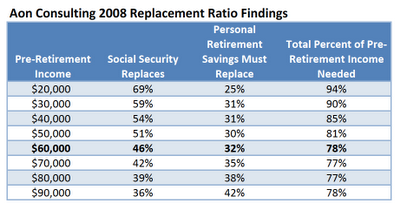 The rest (32% of $60,000, or $19,200 per year) would need to come from personal retirement savings. These are percentages of pre-retirement income. Looked at as a percentage of their new post-retirement income of $48,800, Social Security might provide about 59% of your retirement income and 41% would need to come from savings. 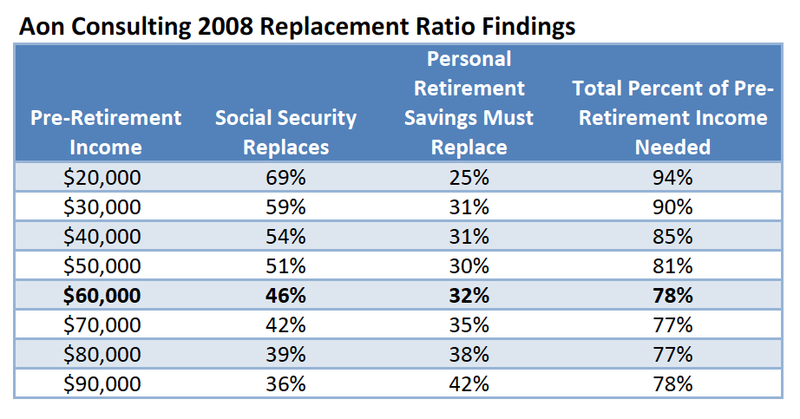 Social Security is the most secure component of retirement income. More than half of American workers have no personal retirement savings, at all, and they will be forced to lower their standard of living after they retire. There you have it in a nutshell. You work 35 years and pay FICA taxes and save for retirement. Then you retire for up to 35 more years and live primarily off Social Security benefits and your retirement savings. It isn’t a great system. I’ll explain why in my next post. Because savings balances grow exponentially, beginning to save past age 35 requires you to save an enormous chunk of your take-home pay. Pfau, for example, estimates that if you begin saving at age 45, you’d need to save about 36% of each paycheck. So, I’ll stop my table at age 35 and simply say that if you start saving much later than that, you’re probably screwed. Given that we need to save somewhere around 15% of our take-home pay every year of our careers until our mid-60’s, how much are Americans actually saving? It depends on your income level, of course. If you make lots of money, it’s easier to save lots of money than if you’re scrimping by to pay the mortgage and help a kid through college. But, here are the averages according to an Aon Consulting study. Nothing close to 15%, right? Not even for high-earners. And those numbers are for workers who have a 401(k) plan. 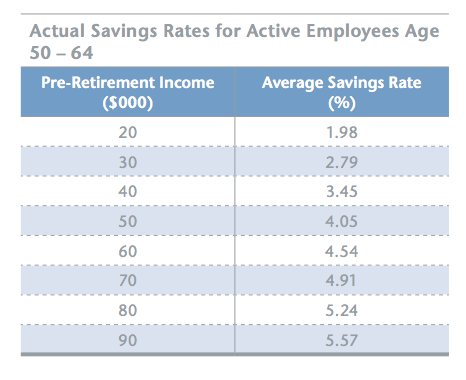 About half of workers are saving nothing at all for retirement. "First, save as much as you can, start as early as you can, and don't ever stop." The fact is only wealthy people can save at rates like these. Our current retirement system is failing us miserably. But this blog is for the unwealthy, so stick with me and I’ll explore what you can do to make the best of a bad situation. You can get more information from my book, Retiring WhenYour 401(k) Fails.